A famous pet nutritional study by Dr. Francis M. Pottenger demonstrated that a 'life-long diet' of processed or cooked foods as the main reason why animals develop chronic degenerative diseases, infections and other maladies. Over a lifetime this type of diet adds to the growing list of health problems pets experience including; Osteoarthritis, hip dysplasia, digestive disorders, food allergies, joint pain, inflammation, fatigue, dry itchy skin, shedding, hot spots and other many stress related symptoms. If you are feeding your pet one of today's popular processed pet foods, then chances are, your pet's body is depleted of the primary enzymes precursors nature provides abundantly in all living foods. Even the best commercial pet foods have their enzymes Wafer destroyed through heat, processing, preservatives and other chemicals. The problem is, If there are NO enzymes Wafer in your pet's food then there is little else left to help protect their body. Give your pet a concentrated supplement which includes live enzymes rich foods and antioxidant vitamins like those in Biovet Antioxidant Pet Wafers. This powerful formula has been used by nutrition conscious veterinarians and pet owners for over 15 years to help reduce pain and restore mobility and increase vitality in animals of all ages. jadeEvery pet, young or old, must have a daily source of live enzymes Wafer to help replenish their body's needed resources. 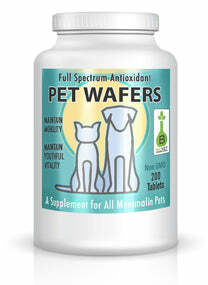 Pet Wafer help to cleanse toxins and free radicals from their soft tissues and restore the normal healthy functioning of their body's immune system. Look what Pet Wafer did for Shana! In December of 1999, my 12 yr. old dog Shana had a stroke that left her with her head tilted to the side. She had lost her appetite, her eyes were dull and she was very listless. Her painful arthritis now left her hind quarters so weak and shaky that she couldn't use the stairs without our help. To top that, a bloody cyst opened on her spine my vet thought was cancerous. She fed Shana intravenously but decided against surgery because she did not feel Shana could survive the anesthesia in her weakened condition. Based on these overwhelming symptoms the vet felt that Shana would pass away very soon. I couldn't accept this prognosis and starting looking on the Internet for more help. When I found the Pet Wafer site, I read the testimonials and decided to call to place an order near the end of January. To be honest, I wasn't sure Shana would even survive until the Pet Wafer could arrive, but I got them in just 3 days. Even though I was suppose to double the initial dosage for the for the first two weeks, I only gave Shana one (1) Pet Wafer treat per day as I didn't want to overwhelm her body. After several days I noticed she seemed to have more energy and a will to live. Day by day I saw little improvements. Her eyes got shiny, her cyst started to heal, her appetite increased and she seemed to enjoy life again. After 30 days, she can go up and down the stairs without our help, and she's walking over a mile a day. Plus she has a spring in her step that I haven't seen in quite awhile. Remember she could barely raise herself only a month ago. The symptoms of the stroke have totally disappeared and the terrible cyst on her back is almost completely healed. I know this story sounds to good to be true, believe me, I was amazed myself at this miracle. I promise you, every word is true and is exactly as I stated it. I'm so thankful to have Shana alive and well. Recently, we tried Biovet's Dismutase Granules in a nine-year old, 95 pound female Mastiff cross, who had severe pain in the rear quarters. Due to her age and the reluctance to anesthetize for pelvic radiographs, we opted to treat based on the history and our own physical examination which supported pelvic arthritis. She was placed on one teaspoon of the granules daily. They were mixed in a small amount of honey. The dog is now able to move about in a normal manner without apparent pain, and the owner is very satisfied. This product obviously works and it does so at the cellular level, by applying sufficient enzyme action to reduce the Superoxide radical. A second advantage live enzymes offer over other anti-inflammatory drugs is that it is not a drug, it is all natural and it has no side affects. We plan to continue the incorporation of Biovet's products into our treatment protocol as a means of reducing pain and increasing the quality of life to those patients suffering from arthritis. In cases where old fractures have left dogs lame, we have used Dismutase to encourage use of the leg and found it to be very beneficial. In two large dogs with complete fusion of all lumbar vertebra, Dismutase has greatly benefited the comfort of these animals. The owner of a basset hound with this condition was seriously contemplating euthanasia but now is very happy with her decision to use Dismutase. This dog totally down and in severe pain is now a functional happy pet. She has been on Dismutase 6 months. In a Chihuahua, Dismutase was effective in relieving pain associated with what appears radio graphically as a fusion of several cervical vertebra. Dismutase has been used recently in two cases to reduce pain in lumbar disc syndrome. Both dogs were small and made the response with Dismutase alone as we had seen when dexamethazone was used. An 80 pound, 9 year old female Doberman had received an injury to her left foreleg approximately two years previous to our seeing her. She cried in pain and would not walk. A radiograph of the leg revealed severe osteo-arthritis of the carpal bones. She was placed on Dismutase and was walking the next day and apparently without pain. She was continued on Dismutase on a reasonably consistent basis over the next year and a half without any side effects. Dismutase has been used in many cases of osteoarthritis of the hip joint with very favorable results. We have been using Biovet's Dismutase for several years and along with our clients, have been very satisfied with the results. Although not a panacea for all forms of arthritis, we have seen it help in the great majority of cases where arthritis of some form has been the diagnosis. The usual response time is 4-5 days, although we have seen some dramatic 1 day turn-around. 12 year old Dachshund-Severe bursitis in both front shoulders. Hurts when trying to get up or going down stairs. Has been on 1 DISMUTASE twice daily for the last 3 months and doing nicely. Pom-cross-Very severe spondylitis with curvature and alkalosis of spine. We maintained the dog on 1 DISMUTASE, twice a day until she was 16 years old. Therapy was for 4 to 5 years. 10 year old Sheltie-Spondylitis-Very painful on getting up or going up and down stairs. Maintained her on 1 DISMUTASE. twice daily until 14 years old, at which time she had kidney failure. Golden retriever, 9 years old-weight l00 Lbs. Could not climb steps and was having trouble getting up. After using initial dose of 2 DISMUTASE-twice daily, reduced to 1-twice daily and was able to maintain dog well until death. Two St. Bernard's-average weight, 200 Lbs. Both had grade 4 hip dysphasia. Both dogs received 3 DISMUTASE twice daily for the last 4 years. If missed giving for longer than 2 days, they could not get up and walk without help. Got along quite well on DISMUTASE. We tried 2,000 units S.O.D. but did not work. Border Collie mix-10 years old. Could not stand on back legs. Right leg had atrophied and the dog had not put weight on it for two years. Gave DISMUTASE twice daily. In two days dog was up and walking. In one week dog was putting weight on the leg he had not used in two years. 4 yr. old Bull mastiff, Babe, treated at Purdue School of Veterinary Medicine with adrianycin. Side effects included anorexia, vomiting and diarrhea. Babe was given 4 DISMUTASE twice daily at our hospital, and in two days all symptoms disappeared. Before and during the next treatment, given here, she was again put on 4 DISMUTASE twice daily; no side effects were noted. For her third treatment, she was again taken to Purdue for reevaluation and treatment; no DISMUTASE pre or post treatment. Again she developed the same symptoms as first seen. The last two treatments were given here, using pre and post DISMUTASE. No side effects developed. The doctor in charge of her at Purdue said Babe lived about 2 years longer than usual with this disease in the stage when first seen. During March 1988 we treated a year old male Siamese. He suffered with chronic and severe upper respiratory symptoms, diagnosed as the aftermath of a strep infection he contracted a year earlier while a patient at the University of Georgia for an intestinal virus. He has spent most of his life on antibiotics, primarily Geocillin. He was placed on DMG; his symptoms continued and the use of antibiotics continued. During January 1989 we started two Feline Support per day. Use of the DMG was also continued. Within two months he was symptom free, reduced to one Feline Support per day, and off antibiotics. Continuation of DMG was found to be essential as well. During May 1988, we treated a 6-week old kitten suffering from smoke inhalation in a house fire. The kitten survived but was left with bronchial symptoms. The bronchial symptoms subsided with antibiotics, but returned within a few days when antibiotics were stopped. During September 1988, started on DMG and one DISMUTASE daily. Symptoms continued until one FELINE SUPPORT was added to her daily regimen, after which she stayed symptom free. Again, DMG was found to be essential for maintenance. An 11-year-old DLH clinic cat, after a course of treatment with Fulvicin, developed enlarged Lymph glands. He was extremely lethargic. On 2/8/89 he was started on two DISMUTASE and two FELINE SUPPORT daily and then reduced to one each daily. By May he was symptom free and acting like a younger, healthy cat. During the middle of June, we stopped the FELINE SUPPORT but continued the DISMUTASE. Within one week the cats behavior again became quite lethargic, with no other symptoms of illness. Back on the FELINE SUPPORT for 3 days, he became more active and his behavior returned to its previous level. The doctor feels that the CANINE SUPPORT did more for this animal than anything else. Until the surgery she was doing better than she had done in her adult life, was well enough to show, and Dr. Tilghman credited the CANINE SUPPORT for that improvement. On CANINE SUPPORT the animal's behavior became more animated. Her appetite increased considerably. Kikko gained weight and the condition of her coat improved. As you will note, the RBC increased and the WBC decreased with the administration of the CANINE SUPPORT. Kidney and liver values dropped.